Kyaw Kyaw, 22, from Kyaukpyu village, poses for a portrait in his home in the Thay Chaung camp for internally displaced Rohingya in Sittwe, Myanmar, November 2015. 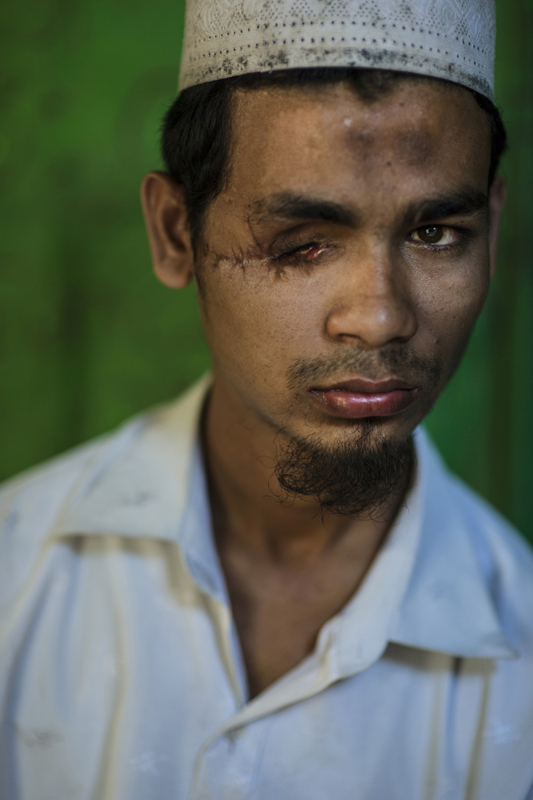 Kyaw Kyaw was shot in the eye during the second round of violence in Myanmar in October 2012, and spent weeks in a government hospital in Sittwe before recovering and returning home. He is blind in one eye, and is not able to work and help his family survive. “I am not angry with the situation: I am always trying to be comfortable with people according to their religious decision. [This happened] because they wanted to cause problems for islam in general. Right now, we are having a lot of difficulties. My father can’t work; we can’t get money, and there are so many problems. We are suffering from many things right now. I used to have many friends—females, males—now I am the only one left, because anyone who has any money, left. Now I don’t have any friends. Yes, I feel very bad I lost my eye. I feel extremely sad. There are times when people talk down to me, but I am a man, and I am capable. My mother is getting old now, and I have to think about how to find a livelihood for her myself. If you want to think about how difficult it is for me, just imagine life without sight. Just close your eyes, and imagine. Of course I am frightened. I want to live in peace.